South actress Bhavana got married to her longtime boyfriend Naveen, who is a producer, last week and we are not over the pictures yet. New photos from their wedding and reception album have been shared by their official wedding photographer and they are truly dreamy to say the least. Bhavana and Naveen got married in a simple ceremony in Kerala on January 22, which was only attended by their family and close friends. A grand reception followed the wedding where the newly-weds met their guests from the film industry. For the wedding, Bhavana wore a gold kanjivaram sari with temple jewellery while for the reception, the actress changed into an embellished lehenga accessorised with a spectacular diamond necklace. Bhavana was only 16 when she made her big screen debut in Malayalam film Nammal (2002). The film was a commercial success. Bhavana won the Best Actress (Special Jury) trophy in Kerala State Awards for her role in the film. She followed it up with films such as Chithiram Pesuthadi, Daivanamathil, Swapnakoodu and C.I.D. Moosa among others. She has also starred in Tamil film Chithiram Pesuthadi, Telugu film Ontari and Jackie in Kannada. Last year, she was seen in four Malayalam films - Honey Bee 2: Celebrations, Adventures of Omanakkuttan, Vilakkumaram and Adam Joan. Her next project is Tagaru. 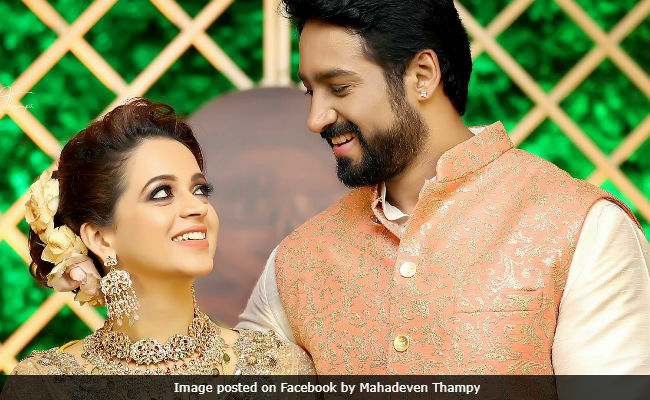 Actress Bhavana Engaged To Naveen, Celebs Wish Them "Lifetime Of Happiness"